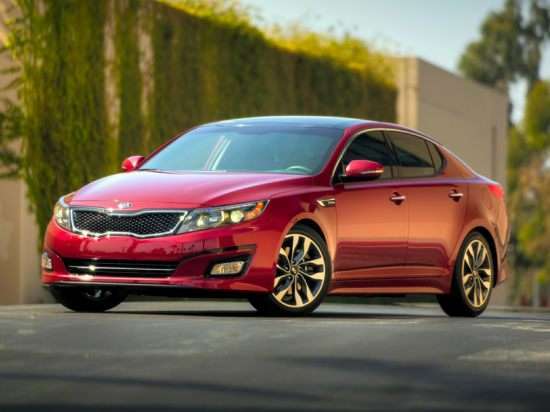 Kia makes few changes to the 2015 Optima as it readies a replacement for the popular midsize family sedan. Three new colors debut and the base LX model is now offered with black cloth seats. Acoustic laminated windshield glass helps to quiet the cabin, and a next-generation version of UVO eServices technology debuts. When buying a 2015 Optima, the first thing you decide is whether or not you want a 4-cylinder, a turbocharged 4-cylinder, or a gas-electric hybrid powertrain. Hybrids, as this summary is written, remain 2014 models, offered in LX and EX trim. Turbos are available in SX Turbo and SX Limited trim. The standard 4-cylinder engine can be paired with LX, EX, or SX trim. Choose the EX model for leather seats, dual-zone automatic climate control, keyless passive entry with push-button engine starting, and nicer trim inside and out. The SX adds a sportier appearance, LED lighting, paddle shifters, larger wheels and tires, and special detailing. Buy the SX Limited if you want everything Kia offers for the Optima as standard equipment. Exclusives include LED fog lights, chrome wheels, red brake calipers, an electronic parking brake, a first-aid kit, a universal garage door opener, and premium Nappa leather upholstery. A 192-horsepower, 2.4-liter 4-cylinder engine is standard for the Optima LX, EX, and SX models, while the SX Turbo and SX Limited variants feature a turbocharged 2.0-liter 4-cylinder good for 274 horsepower and an impressive 269 lb.-ft. of torque between 1,650 rpm and 4,500 rpm. Needless to say, that’s a strong engine. Hybrids make 199 horsepower thanks to a 2.4-liter 4-cylinder engine, an electric assist motor, and a lithium-polymer battery. Torque measures 235 lb.-ft., and peaks from 1,000 rpm to 2,500 rpm. All Kia Optima models are equipped with a 6-speed automatic transmission that delivers power to the car’s front wheels. In combined driving, the Optima LX, EX, and SX are rated to return 27 mpg. Choose the SX Turbo or SX Limited model, and you might expect to get 24 mpg. Hybrids are the fuel-efficient choice, coming in at 37 mpg to 38 mpg, with heavier EX models proving slightly less fuel-efficient. New for 2015, a next-generation UVO eServices infotainment system equips this Kia with speed alerts, curfew alerts, and geo-fenced driving boundary alerts, helping parents with young drivers in the household to keep a virtual eye on their offspring. Mom and Dad can also access a “driving score,” which reflects how the Optima has been driven while it was away from home. Additionally, the 2015 Optima is available with a blind-spot information system, a rear cross-traffic alert system, a reversing camera, and rear parking assist sensors. A premium audio system and a navigation system are also available.